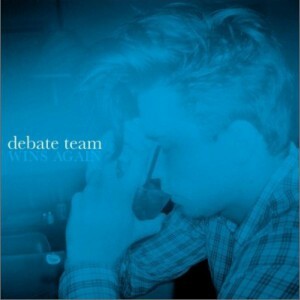 Debate Team is an indie-pop/rock band hailing from Los Angeles, California. Singer Ryan McNeill enlisted the musical prowess and star-power of guitarist Drew Brown (OneRepublic), drummer Dan Konopka (OK Go), bassist Bob Morris (The Hush Sound), and keyboardist Adam James to transform his songs into high-energy power-pop gems with catchy hooks and swelling, noisy guitars. Ryan, a native of Oklahoma, moved to Los Angeles in 2003 and began working on material with friend and roommate Drew Brown. Sharing a passion for Elvis Costello, Queen, the Flaming Lips, and ‘90s Britpop, Ryan and Drew began working on music together and quickly amassed a collection of DIY home recordings. Just as their thrown-together “band” began to find its own identity, Drew’s other project, OneRepublic, scored a massive radio hit. World tours, talk show appearances and champagne baths beckoned for Drew, putting Debate Team on hiatus for the better part of two years. However, in 2009 Debate Team was resuscitated after a chance meeting between Ryan and Dan Konopka. Ryan overheard Dan at a pool party talking about his experience recording with Dave Fridman, legendary producer of the Flaming Lips, MGMT and Weezer. “I told Dan about this music Drew and I had worked on and asked him if he ever had any interest in playing drums on a side project. I gave him a CD, but honestly didn’t think anything would come of it. 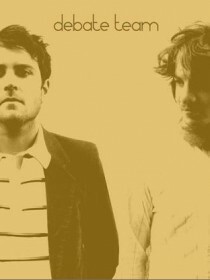 I was surprised when he called me the next day saying he really dug the songs and wanted to play with us.” Around this time, Bob Morris of the Hush Sound and Adam James moved to LA from Chicago to round out the roster of this newly revived collective. Capitalizing on their momentum, they immediately booked studio time to bang out the band’s first EP. According to Ryan, “Some of these songs, we had never played all together as a band prior to going into the studio. Dan had never even heard the song ‘Leave,’ which we recorded as an afterthought at the end of the last day. I just explained the song’s structure to him and he improvised the perfect recording on the first take. The songs on this EP definitely reflect this excitement and haphazard spontaneity.” In many ways, Debate Team has developed into a creative outlet for its members, enabling them to explore music that might not make sense in their established bands. Although the sound of Debate Team isn’t necessarily identifiable by its member’s other bands, fans of these bands will appreciate Debate Team’s unabashed pop sensibility and universally infectious melodies.